Instant Imprints Burnaby | Custom T-Shirts, Embroidery, Signs and More! At Instant Imprints Burnaby, our customers come to us when they want to be more visible to their customers. We create that visibility five different ways: Branded Apparel (embroidery), Signs & Banners, Promotional Products, Custom T-Shirts and Print Services. Are you looking to take your brand to the next level with custom t-shirts, printing services, promotional products, custom banners or branded embroidery items? Instant Imprints Burnaby has some of the best printing services in all of BC! Whether you’re looking to take your brand across Canada or around the world, Instant Imprints can help you achieve your visibility goals from start to finish. Our Image Experts have the vision and the skill to help you craft the perfect custom t-shirt or banner. Just ask Siri, Alexa, or your Assistant, “where can I create custom t-shirts near me?” You’ll find us here on Antrim Avenue! Your promotional materials represent your brand as a whole—they’re often the first impression potential customers have of your business. When you need the best marketing materials in BC, Instant Imprints can bring you a global level of service with the local, friendly Canadian attention to detail. We make it a point to get your job done on time or early, and get it done right the first time. This helps you avoid the costly revisions that less professional home or office printing solutions can lead to! Every brand knows the power of custom t-shirts. They’re a great way to turn your logo into a fashion statement and spread brand visibility around the globe. If you need to create personalized business shirts or brings your custom tees to a whole new level of style, we have an embroidery service that can deliver Burnaby’s best! Our state-of-the-art custom t-shirt capabilities combined with the artistic touch of an Image Expert makes your visit to Instant Imprints a slam dunk for your brand. Whether you’re looking to spread your logo throughout Burnaby, around BC or across the seven seas, let Instant Imprints help you revitalize your brand image. 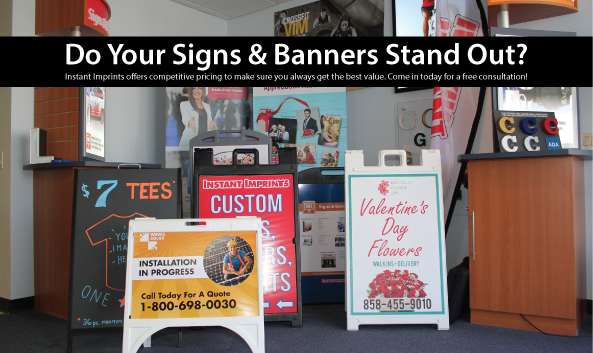 Custom signs and banners are a tried-and-true way to bring your business to the public. Work with the best print shop in Barnaby and across BC. Pay a visit to our showroom on Antrim avenue, give us a call at (604) 620-4988 or request a quote online to get started today!